Join Us for the Opening Reception February 1, 7-9pm! A prominent mid-career artist based in Brooklyn, Miguel Luciano works in multiple media to examine issues of cultural identity, politics, and popular culture. 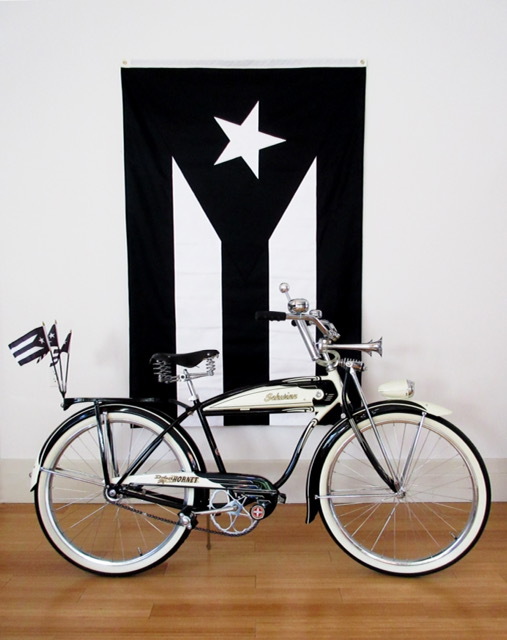 BRIC has commissioned Luciano to create new work – sculptures featuring customized vintage Schwinn bicycles – that commemorate the traditions of Puerto Rican bike clubs in New York. He will exhibit this work along with paintings and historic ephemera that question the colonial relationship between the United States and Puerto Rico, at the centennial mark of U.S. Citizenship for Puerto Ricans (1917-2017). This body of work acts as a powerful commentary on the current economic and political crisis in Puerto Rico and examines its impact on the diaspora.